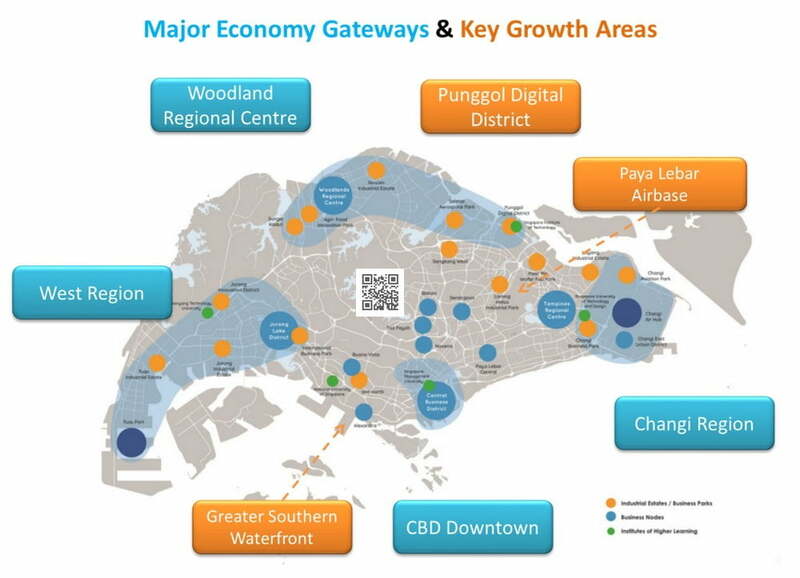 2019 Singapore Master Plan was recently released. What are the major economic gateways & key growth areas, and some properties in these places? The 2019 master plan focuses on planning for inclusive, sustainable, and green neighbourhoods with spaces for community and amenities for all to enjoy. The objective is to help shape Singapore into a more inclusive, sustainable and resilient city that people will enjoy living in and build an endearing home for our families. The long-term planning in Singapore is done in two segments: the Concept Plan, and the Master Plan. The Concept Plan guides Singapore’s development over the next 40 to 50 years, and covers strategic land use and transportation. The Concept Plan is reviewed every 10 years. The Master Plan translates the Concept Plan into more detailed plans for implementation. It specifies permissible land use and densities, with the aim of guiding development over the next 10 to 15 years. The Master Plan is reviewed every 5 years. See chart below the illustration of master plan.